In the third week of FOX’s “So You Think You Can Dance” Academy of season 15 we have our Top 20 dancers. In keeping with SYTYCD tradition, that consisted of ten men and ten women. 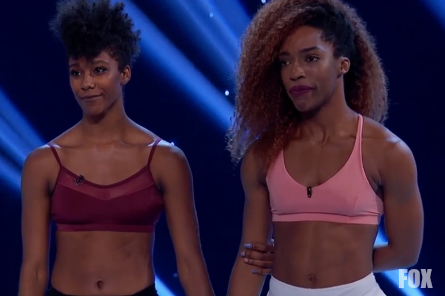 After the instruction of top-notch choreographers and SYTYCD All-Stars, judges critiqued dancers duets to move forward in moving the cream of the crop to the top that resulted in the Top 10. In this episode, the Top 5 women were chosen. Next week will end in the Top 10 men revealed for the Live Shows. Dancers had to tackle a dance style outside of their own. First up was 18-year-old Hannahlei. Judges said they’ve NEVER been disappointed from Hannahlei. She was given Salsa to perform with All-Star Jonathan Platero under the guidence of choreographer Oksan Platero (Jonathan’s wife). Hannahlei said the judges have never seen this side of her and wanted to show them that she can do it all. This is Magda’s second try at SYTYCD. She was cut last season after “Groups” choreography. Magda danced Contemporary with All-Star Robert Roldan under Mandy Moore’s choreography. Robert commented that Magda “deserves a spot in the Top 10” and she used her past to tap into the emotions of the routine, which worked. Magda’s dance with Robert was so beautiful it had judges Mary Murphy and Vanessa Hudgens in tears. Mary said for her to be able to affect them that much in such a short period of time is extraordinary. She added that a lot of ballroom dancers have a hard time giving an “honest” performance. Nigel commented that he’s watched her SYTYCD journey and she should be proud of herself. Dayna is a Jazz dancer who had some difficulty with the ballroom choreography at the Academy. She had to dance Cha-Cha with All-Star Paul, choreographed by Dmitry Chaplin. Paul said Cha-Cha couldn’t be further from Dayna’s element. Mary noticed there were places where Dayna was “a little uncomfortable” and needed more “chemistry” with her partner. Vanessa stated that it seemed that she was having the time of her life which is so important. Nigel commented that Dayna was fearless. Genessy was told by Nigel that she wasn’t “strong enough” in her New York audition. But, she made it all the way through to the Top 20. She said it was that comment that fueled and pushed her to this point in the competition. Genessy is a contemporary dancer who had to dance Hip-Hop with All-Star Fik-Shun and choreographed by Christopher Scott. 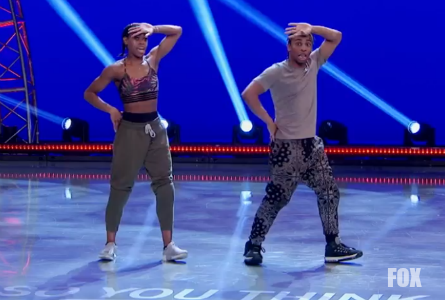 Fik-Shun said he felt like he was dancing with a Top 10 contestant already with Genessy. Nigel was super impressed. He asked her about her training and said it showed that she’s put in the work. Vanessa said Genessy totally brought the fire. Mary said she couldn’t believe her attitude and could tell that Fik-Shun loved dancing with her too. Chelsea had the most difficulty in the Ballroom round at the Academy. She danced Salsa with All-Star Jonathan who said from the start he knew she’d be “killer” in this routine. The judges were surprisingly shocked by Chelsea’s dance ability. Mary commented that Chelsea just “soaked-up all that technique.” Nigel told her congratulations. Vanessa said she did an incredible job. Stephanie auditioned in Los Angeles with her brother Tristen. They both went to the Academy. However, he went home early. She said it was difficult having to leave him in the first cut. She danced Contemporary with last season’s SYTYCD winner Lex and choreographer Mandy Moore. Nigel thought it “was very nice to watch” but no moment where she had a “wow” moment.” Vanessa said her passion and pain was “really beautiful.” But agreed there was no “wow” moment. Mary wanted to see more “liquid” and the way Stephanie moves. Sydney said the judges didn’t start to notice her until the Contemporary round during Academy week. She danced the Cha-Cha with Paul, choreographed by Dmitry Chaplin. Paul said the judges will be very surprised by Sydney and she started to “wow” towards the end of the choreography. Sydney got some harsh critiques from the judges. Mary told her that she still wanted more and Sydney needed to be more grounded in her feet and have more fire. Nigel said he didn’t feel that her body was feeling that music. She didn’t get the Latin fire and Vanessa agreed. Emily said her favorite part of the Academy was doing Contemporary choreography from Travis Wall who she looks up to. Emily danced Hip-Hop with All-Star Fik-Shun and choreographed by Christopher Scott. Emily got to show-off her double-jointedness in her arms. Vanessa thought her performance was great. Mary loved it. But wanted more energy. Nigel commented that she needed a little more strength especially next to Fik-Shun. Mary said Emily started to die towards the end. Jensen got cut during the Group round last season. This season, Jensen is dancing with All-Star Brandon in a Jazz routine choreographed by Ray Leeper. Jensen said she’s excited to show the judges the high-energy and that she can master each style that she’s given. After leaving the stage, Jensen said she thinks she was successful in showing the judges that she has edge and some mood and not just an All-American girl. Before announcing which female dancers would be moving on to the Top 5, Nigel told them to use this experience in their future dance careers. Brianna was the first female dancer to be cut. Nigel said the judges felt that Sydney did not have the drive to feel her Cha-Cha performance. Sydney was also cut. Then, Nigel called Hannahlei forward to tell her that a lot of times she’s really shy and that personality in her dancing comes across. She has to find something else inside of her to bring out. Hannahlei was the first female to move on to the Top 5. Nigel noted that Jensen gave them the best performance. She was also added to the Top 5. Then, Emily was next. Nigel said they thought from the start she’d be in the Top 10. However, sometimes her performances fall a little flat. Emily was cut and not added to the Top 5. Magda was called next and Nigel said it’s impossible to take all three Ballroom dancers. But they added her. Next up was Genessy, who Nigel said during the Academy week, she flew under their radar. But, she’s in the Top 5 now! Stephanie was next. Nigel said there were times when the other ballroom dancers out-shined her, and vice versa. Nigel and Mary said it was really a difficult decision to cut her, and they want her to come back next season. The last two dancers left standing waiting to hear their fates were Dayna and Chelsea. Nigel said they based their decison on the way they both danced their duets. They added Chelsea to the Top 5. THE TOP 5 WOMEN: Hannahlei, Jensen, Magda, Gennesey, Chelsea. NEXT WEEK: It’s the mens’ turn to see which five of the ten will be moving on to the Live Shows.